Balance sheets... income statements... P&L... What do they all mean? You may be amazing at what you do, but you may have always found your knowledge of financial statements to be a weakness for you. Understanding them may only be step one, organization is key when maintaining the financials of your business. Common Sense Business Solutions has developed a specially designed filing system that allows you to easily manage information, on the computer or offline. We also can assist in the often hairy paperless transition, to ensure nothing falls through the cracks or becomes skewed in the transition. You are responsible for the accuracy of your tax return. Are you fully aware of what you enter on your personal and business tax information? 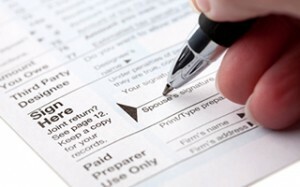 You should be able to explain and understand your tax forms, and don't be embarrassed to ask for help. Common Sense Business Solutions provides training in 1:1 or seminar workshop environments that will enable you to feel confident about understanding and discussing your tax forms. Many small business owners want to expand their use of financial accounting software. These programs can be an excellent tool for understanding and tracking the finances of the business but can be a real disaster if they are set up wrong or used incorrectly. Common Sense Business Solutions can teach you how to use accounting software such as Quickbooks. This extremely powerful tool can be used to create P&L statements, job costing analysis, and many other customized reports.